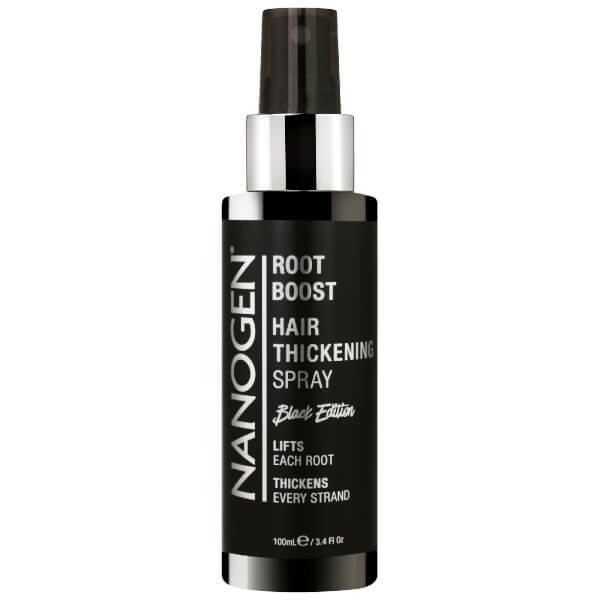 Transform thin, fine hair with Nanogen's Root Boost Hair Thickening Spray Black Edition; a lightweight, fast-absorbing formula that works to energise strands from the roots. Powered by Keratin, Caffeine and heat-activated Proteins, the plumping spray delivers instant volume and promotes healthy hair growth, whilst defending against the damaging effects of heat styling and environmental aggressors. Soothing Niacinamide nourishes the scalp for long-lasting comfort. Expect big, bouncy locks with restored vitality. Free from parabens and SLS/SLES. Spray on dry or damp hair from root to tip for maximum volume. Or focus on roots only for a more intense root boost. Optional: Blow-dry your hair to activate more thickening proteins. Style your hair as usual. For best results use every time you wash your hair.